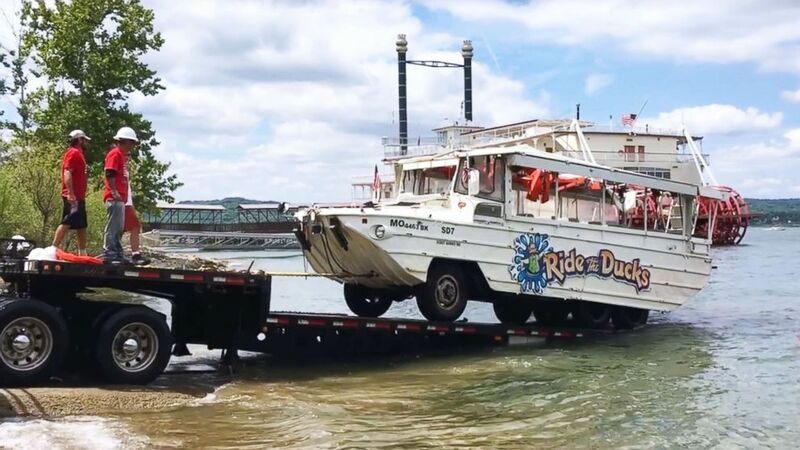 Missouri investigators raised a duck boat that capsized and sank. The search for answers in the tragic capsizing of a Missouri duck boat that left 17 tourists dead was poised to take a big leap forward Monday after crews raised the doomed vessel from the bottom of a lake. 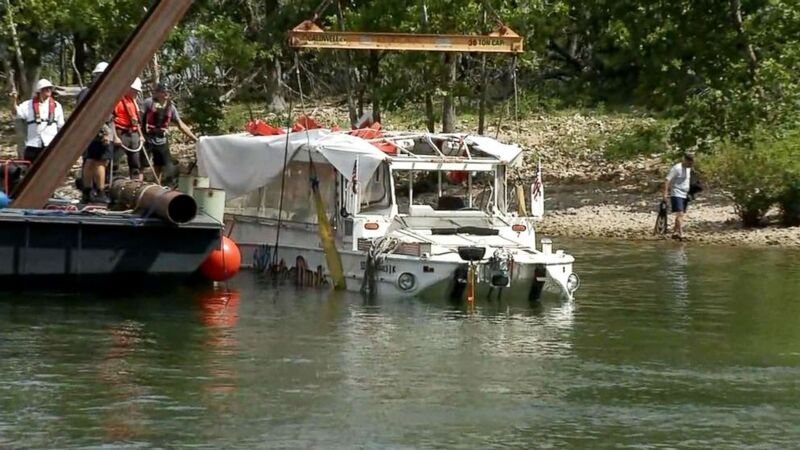 A salvage operation at Table Rock Lake near Branson brought the duck boat to the surface just after 11 a.m. Orange life jackets could be seen dangling from the canopy of the boat and a soggy American flag was posted near where the driver sat. (Western Taney County Fire Protection District ) Investigators remove the duck boat on July 23, 2018, from Table Rock Lake near Branson, Mo., five days after it capsized in a storm killing 17 passengers. As the boat was being raised, Jim Hall, a former chairman of the National Transportation Safety Board, told ABC News it was time to ban the use of duck boats for commercial recreation use. Hall said the tragedy will likely mirror aspects of one that occurred in 1999 on Lake Hamilton in Hot Springs, Arkansas, when a duck boat capsized and killed 13 of 21 people aboard. An NTSB report on the incident concluded that "lack of reserve buoyancy and inadequate Coast Guard oversight" were contributing factors to the accident. "The boats are not designed for the type of use that they are being employed for. They're not seaworthy for this type of use," Hall said. "That's essentially why one of the safest ways to do it is to ban it because you have being brought on these boats children, who are not making informed decisions for themselves and adults bringing them on without adequate warnings." Hall said there has been "very little movement" in efforts to regulate the industry over the past 20 years, despite multiple accidents and fatalities involving duck boats both on and out of the water. "Even with amusement rides, which this essentially is, there are restrictions on height and weight, the operations in winds, etcetera," Hall said. "I haven't seen any movement at any level to prevent something like this occurring." He said that while the aviation industry has made strides in building a strong safety code, "we do not have that in the marine industry." "The Coast Guard does not have the resources to provide any meaningful oversight, and most of the states are more concerned about wildlife and recreational use of waterways than they are overseeing operations like this," he said. On July 19, the amphibious boat, modeled after World War II watercraft, capsized and sank in about 80 feet of water. Of the 31 people aboard the boat, 17 died. (Courtesy Trent Behr) A video grab shows a tourist duck boat taking on water in a lake near Branson, Mo., July 20, 2018. Tia Coleman of Indianapolis, Indiana, lost nine members of her family in the accident, including her husband and three children, ages 1 to 9. She and her 13-year-old nephew, Donovan Hall, were the only members of her family to survive. During an emotional press conference on Saturday, Coleman said that when they boarded the boat the captain told them they would not need life jackets. "He said, 'Above you are your life jackets. There are three sizes. I'm gonna show you where they are, but you won't need them. So, no need to worry.' So we didn't grab them," Coleman said. "The biggest thing that stood out to me is I felt like if I was able to get a life jacket I could have saved my babies because they could have at least floated up to the top and somebody would have grabbed them," she said, her voice cracking again with emotion. "And I wasn't able to do that." 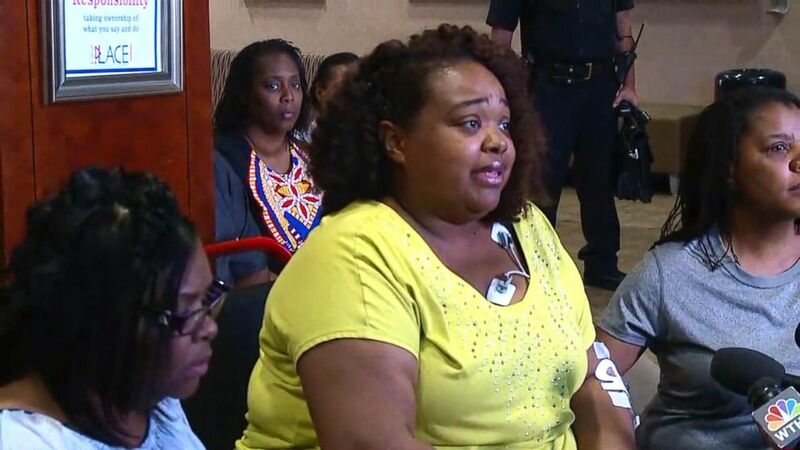 (ABC News) Tia Coleman talked about the support she has received from family and friends and her faith since surviving the duck boat tragedy that left nine of her relatives dead. Coast Guard officials said the boat will be taken to a secure facility for further inspection and investigation. The National Transportation Safety Board is leading the investigation. Over the weekend, divers recovered the boat's trip data recorder, which is similar to a commercial plane's black box, and sent it to the NTSB lab in Washington, D.C., to be analyzed. Investigators have not commented on a possible cause of the accident. But cellphone video taken before the boat capsized showed it was struggling to make it back to shore after a fierce storm struck. 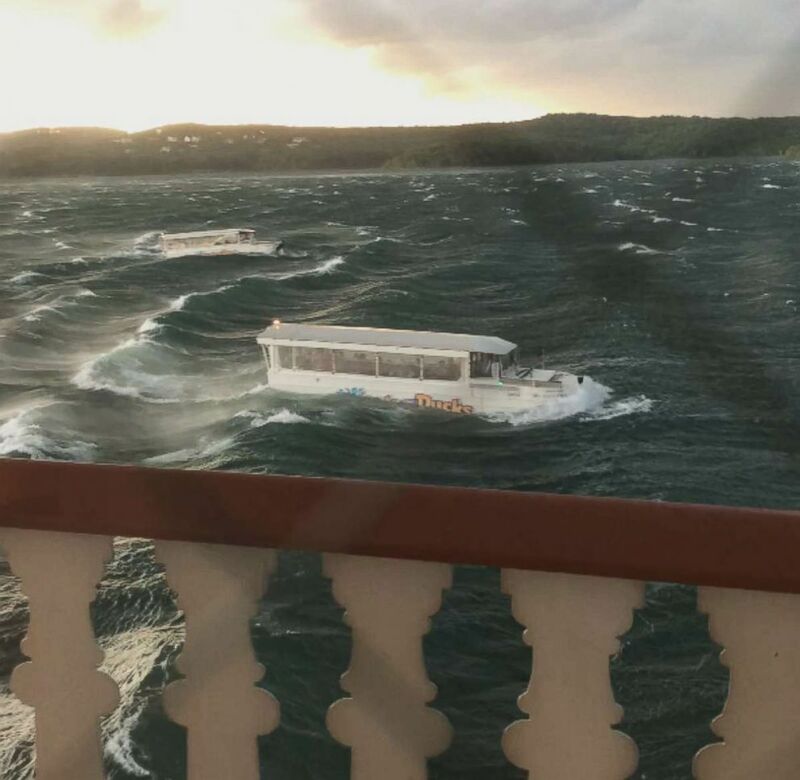 The boat was also buffeted by near hurricane-force gusts of 73 miles per hour, officials said. An August 2017 report by a private inspector warned the Ride the Ducks company of design flaws that could make the vessels vulnerable to sinking in inclement weather. (Francois Duckett/AP) The inspection service issued a written report on the vessels for the company in August 2017. 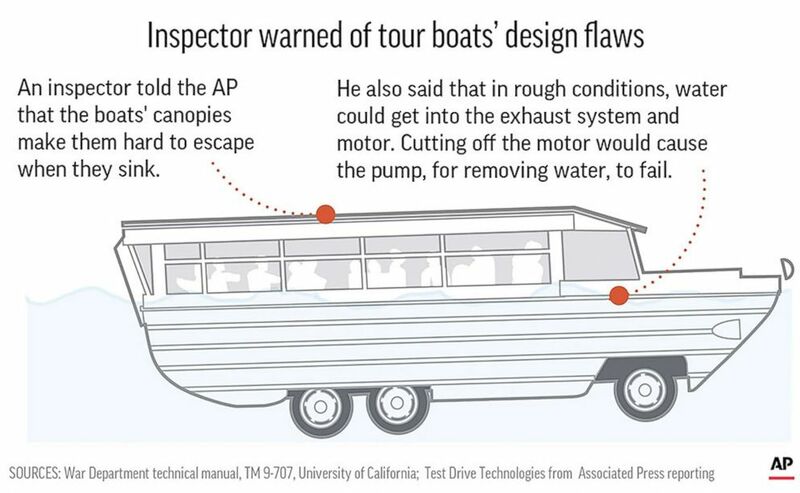 Steve Paul, the owner of Test Drive Technologies inspection service, told The Associated Press that he informed the owners of the duck boat company that the boats' engines and pumps might fail in bad weather. His report also warned that the boats' canopies made it harder for passengers to escape in an emergency.